Lentil Burrito Bowls. I have been having a love affair with lentils lately. This time it’s a recipe for vegan burrito bowls. My other recent recipes were the Lentil Sloppy Joes and the Easy Lentil Loaf. I do also have another recipe for healthy burrito bowls as well. That one is made with a cilantro rice as a base. These healthy burrito bowls use lentils and tomatoes as the base. This recipe is super easy. The lentil base cooks very quickly. Then all you need to do is add the fixings. I added corn, tomatoes, lettuce, avocado and roasted red peppers. 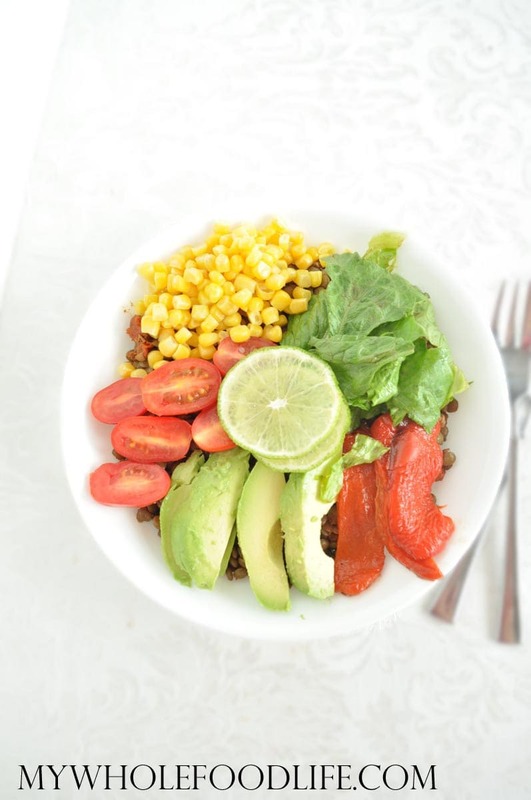 All you need to do is add your favorite toppings to these lentil burrito bowls. Optional toppings: roasted peppers, tomatoes, lettuce, avocado, salsa and corn. In a large saute pan, cook all the ingredients on low until all the liquid is absorbed and the lentils are softened. About 35 minutes. Finish with your favorite toppings. Enjoy! I made this for dinner tonight & my whole family loved it! It sounds like you may be cooking them too long. I like to slightly under cook mine so they have a little bite to them. what is the difference between red, green and brown lentils?